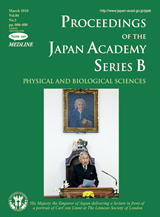 His Majesty the Emperor of Japan was elected a Foreign Member of the Linnean Society of London in 1980 in recognition of his substantial contributions to the science of biological taxonomy. His Majesty showed for the first time in Japan that taxonomy based on the arrangements of sensory papillae on the head and the phylogeny of the morphological characters can be used as definitive features for classifying gobioid fish. In 2007, Their Majesties the Emperor and Empress were invited by the Linnean Society of London to attend the celebrations of the 300th anniversary of the birth of Carl von Linné. On that occasion, His Majesty generously delivered a keynote address in which he discussed the important seminal works of Carl von Linné. His Majesty also described very vividly the profound contribution that Linné’s disciples made to the development of taxonomy in Japan. His Majesty, in discussing his own field of research, said that he found that there were many unnamed fish and, in particular, that there were many gobioid fish that had to be given scientific names. His Majesty has been investigating the relationships among many kinds of gobioids and has been concentrating on the analyses of their bones and on the comparison of the arrangement of their head sensory canal pore and sensory papillae. In his address, His Majesty also spoke of the discovery of ginkgo and cycad sperm by two Japanese researchers. These discoveries were awarded the second Imperial Award of the Japan Academy in 1912, nearly 100 years ago. By a fortunate turn of fate, the Japan Academy will be celebrating the 100th anniversary of the Imperial Award later this year. It is interesting to note that Carl von Linné himself, in his original famous work, gave the current scientific name Ginkgo biloba to Ginko, written as 銀杏 in Japanese. The manuscript prepared by His Majesty for the address at the Linnean Society of London was first published in 2008 as a chapter in the Special Issue No. 8 of The Linnean. With the kind permission of the Linnean Society of London, it is our great honor and pleasure to republish the article in this issue of the Proceedings of the Japan Academy, Series B (pages 143-146). We express our heartfelt thanks to the Linnean Society of London for giving us permission to republish this important scientific paper.